Holmes Miller are taking part in a variety of events across 2019 to raise money for Revive MS Support, a charity based in Glasgow that provides vital therapy, advice and support to people affected by Multiple Sclerosis (MS) in the heart of communities across the West of Scotland in order to enhance their well-being and empower them to live full and productive lives. The famous Kilt Walk is a fun yet challenging walk through some of Scotland most scenic areas with staff taking part in both the ‘Mighty Stride’ 24 miles from Glasgow Green to Balloch Country Park and the ‘Big Stroll’ 15 miles from Clydebank to Balloch Country Park. Billed as Scotland’s toughest trekathon, staff are taking on the 26 mile route through the glen, over the Devils Staircase through the Lairig Mor (the Big Pass) to the base of Ben Nevis. For our keen cyclists there is 85 Miles of closed road cycling beginning and concluding in Pitlochry. The course consists of rolling hills and forest roads around Loch Rannoch and Loch Tummel, combined with the 1,083m climb of Mt Schiehallion. To make efforts and weary legs worthwhile we would be very grateful for your support, encouragement and any charitable donations that you can offer. Donations, large or small, can be made via the following link. Just giving sends your donations straight to Revive MS and automatically claims Gift Aid if you are a UK taxpayer, so your donation is worth even more. If you wish to donate specifically to the Kilt Walk then you can do so via the link below, donations are topped up by 40% by the ‘Hunter Foundation’. Hopefully the new changing rooms will come good today! In this short video Gregor Townsend explains some of the ideas behind the design and how these will benefit the team and hopefully inspire a great victory for Scotland. Holmes Miller worked closely with the Scottish Rugby Union to achieve the vision for a bright, vibrant and robust space utilising the SRU colour palette of blue, grey and purple in the materials. Setting the seats out in a seamless u-shape encourages interaction which is enhanced by the integration of state of the art technology to facilitate instant feedback and make discussions on tactics and strategy more visual. A combination of high quality materials, including solid surface, glass, stainless steel and faux leather, create an appropriate atmosphere which is personalised with embroidered seating pads and etched shower valve plates. LED lighting and scene setting plays a vital role in creating the appropriate mood in the changing rooms as well as highlighting key features such as the player’s shirts, numbers and heritage panels. We are delighted to announce this exciting project has received Planning Approval. 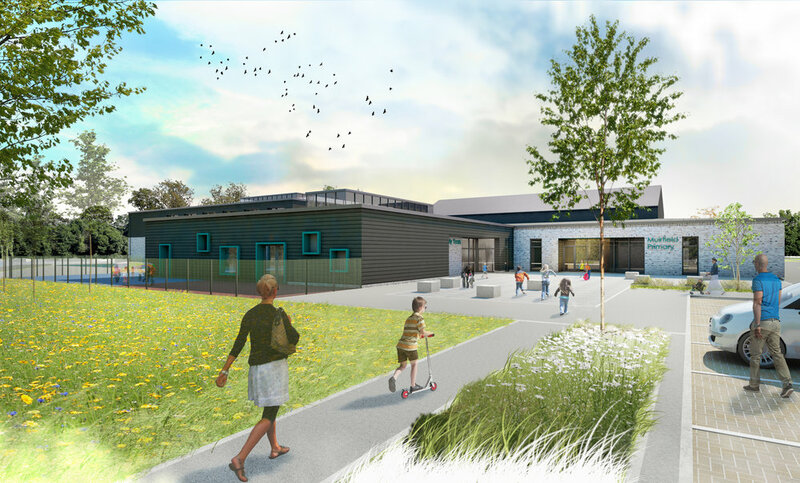 Following in the footsteps of the successful St John’s Primary school completed in August 2018, the new Broomhills Primary School, which is being procured through City of Edinburgh Consultant and Contractor Frameworks, will be located within the new Heritage Grange residential development in the south side of Edinburgh. The undulating quality of the Pentlands Hills was a great source of inspiration for the design of the building. The design of the façade echoes the silhouette created by the summits and by simply extruding this profile the rest of the building is formed. This school façade acts as the civic front to the new park as well as a focal point at the heart of this new community. We received the fantastic news that our proposed restoration, conversion and upgrading of 7 townhouses into 21 luxury flats in the popular Shawlands area was unanimously approved by GCC’s Planning Committee. Our client, Kelvin Properties, proposes to reconfigure each original townhouse to provide a maisonette at ground and basement level, a flat at first floor level, and a maisonette at second and third floors. The scheme will also provide 21 private off-street car parking spaces within a high quality landscaped amenity garden. Holmes Miller are looking forward to attending MIPIM 2019, the premier retail estate event hosted in Cannes, France from 12 - 14 March. We are pleased to receive planning approval for a new build primary school for BAE Systems at Dargavel Village. The 2 stream primary school is a Section 75 obligation as part of BAE’s masterplan for transforming the former Royal Ordnance Factory site into a thriving community with around 4000 homes. Working closely with BAE Systems as developer and CASS Associates as Masterplanners and Planning consultants, our role initially required us to develop the school brief to satisfy the Section 75 agreement and meet education planning legislation. A series of design workshops with Renfrewshire Council allowed the design concept to be refined to satisfy the needs of both BAE Systems, as developer, and Renfrewshire Council, as end user. The school is due to be handed over to Renfrewshire Council in 2021. Robert Kennedy has been invited as one of three jurors to evaluate the Stadium of the Year vote presented by StadiumDB.com. Working on his first stadium project in 1992, Murrayfield Stadium, Edinburgh, for the Scottish Rugby Union, Robert has constructed almost 500,000 seats in the UK and abroad including the RICOH Arena in Coventry, King Power Stadium in Leicester and the aforementioned Murrayfield Stadium, which at 67,500 capacity is the largest for the practice so far. The market has changed and the practice has been successful overseas with the completion of the Ahmedabad Arena in Gujarat, India and the design of a soccer tournament hub in New Jersey, USA. This international market will be a focus in the coming years whilst still servicing work close to home, as proven by redevelopment of the iconic Meadowbank in Edinburgh. 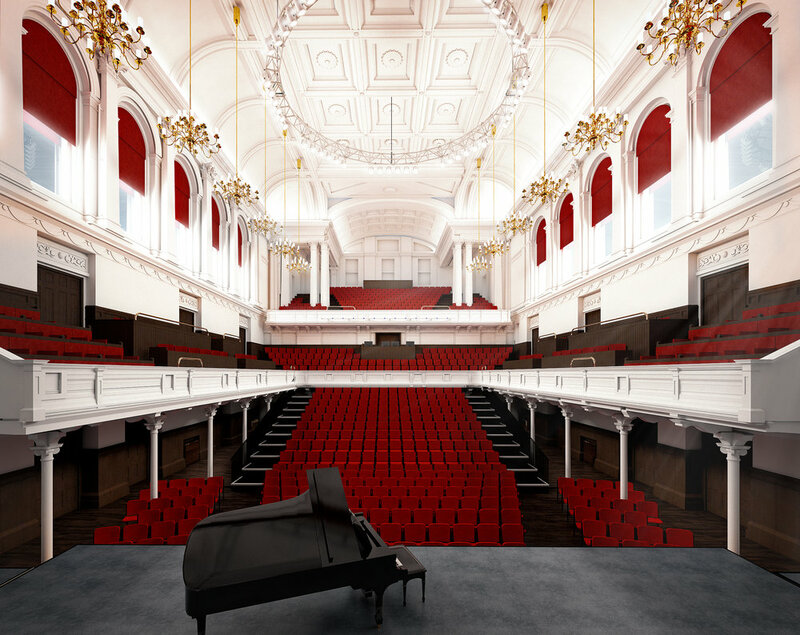 Our work to transform Paisley Town Hall into one of the West of Scotland’s landmark entertainment venues has reached a significant milestone with the submission of a Planning Application and Listed Building Consent. 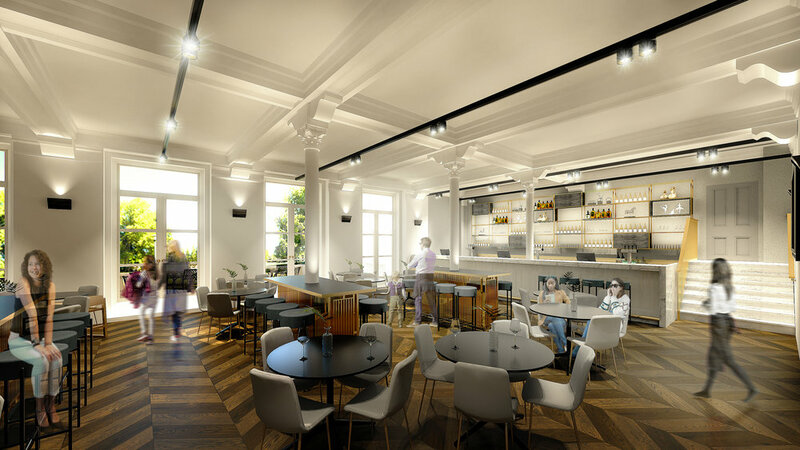 We have worked closely with the Client team at Renfrewshire Council and Renfrewshire Leisure to embrace their aspirations and develop designs to breath new life into the fantastic A-Listed Victorian Town Hall. Some of the key features include increased capacity in the main hall, new cafe bar, new dance studio, new venue-within-a-venue, significant improvements to audience experience and full replacement of mechanical and electrical equipment. The work to the Town Hall is part of Renfrewshire Council’s exciting regeneration programme that seeks to utilise the fantastic built heritage as a catalyst to increase footfall back to the high street and discover all Paisley has to offer. The project is being delivered through hub West Scotland. We were delighted to hear Planning permission has been granted by GCC Planning Committee for a proposed residential development offering 20 units for private sale on a tight urban site in Kent Road adjacent to Charing Cross for our client, Kelvin Properties. Following lengthy pre-application discussions with GCC’s planning department on matters such as massing and scale, Holmes Miller were able to secure the approval with a reduced parking provision for developments outwith the City Centre. In the case of our development, it was deemed by GCC that the policy could be relaxed as it was justified against criteria including place-making, townscape and design requirements, house size and type and due to the fact the site has a high accessibility to public transport. Five Holmes Miller designed stadiums have been chosen today to be hosts for the Rugby League World Cup England 2021. Stadium for West Cumbria in Workington will host 3 men’s group games. York Community Stadium will host a women’s group game and both women’s semi-finals. Ricoh Arena in Coventry will host 1 men’s group game. KCOM stadium in Hull will host 1 men’s group game and 1 men’s quarter final. Riverside Stadium in Middlesbrough will host 1 men’s group game. York Stadium is currently under construction while Stadium for West Cumbria has just been submitted for planning. This is great news for Allerdale Borough Council and City of York Council for having the vision to develop these venues. York Community Stadium is due to open in late 2019, while the Stadium for West Cumbria is due to open in the spring of 2021. Both venues will provide community and sporting legacy well beyond the World Cup. We are excited to share a video showcasing our design for the new Meadowbank Sports Centre for the City of Edinburgh Council. The new stadium replaces the existing Meadowbank complex, originally constructed in 1968. It retains the existing running track which is an important link to historic events including the Commonwealth Games of 1970 and 1986 and to the many significant moments in the history of Scottish Athletics. 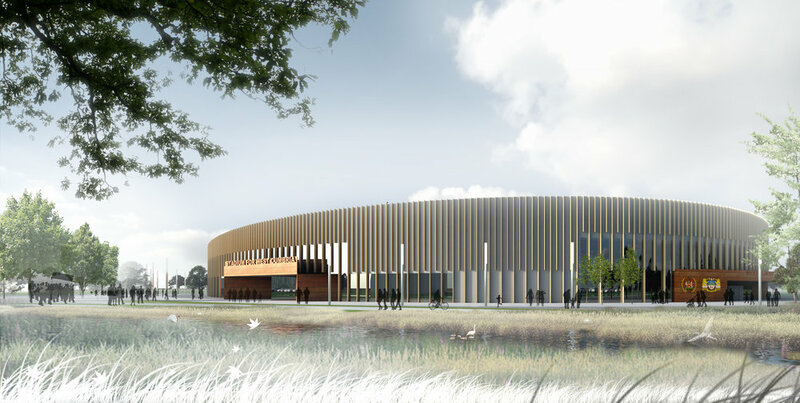 The design comprises an extensive range of internal and external sports facilities including indoor athletics hall, multi-use sports halls, fitness suite and studios, halls for Gymnastics & Martial Arts, Squash Courts and external athletics track, throws area, two synthetic pitches and spectator stand. Graham Construction has been appointed as contractor by the City of Edinburgh Council for the construction of Meadowbank Sports Centre. Holmes Miller are Architects, working with Graham Construction, alongside Aecom and RSP to deliver this exciting project. Works are due to start in January 2019, with the new facility scheduled to open in 2020. How can a building of over 7,000m2 remain approachable, legible and navigable for pupils as young as 2 years old? How can the architectural approach assist and encourage positive transitions between year group stages? How can this multi faith facility maintain open plan, collaborative learning at its heart, whilst recognising the need for distinct school identity? 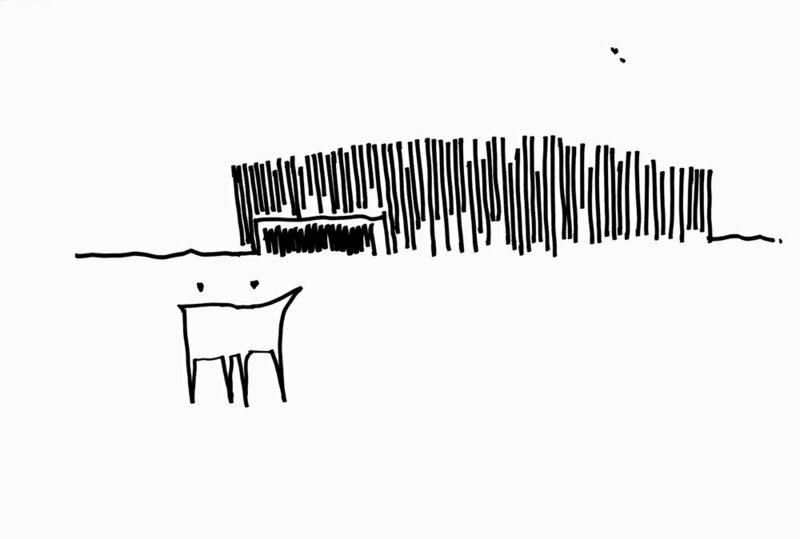 Recognising the differing needs and vulnerabilities of children from pre-school through to graduation to secondary school, the design for NE Campus seeks to respond by addressing the aspects that relate to a pupils ‘day at the school’. On approach, this three storey building may seem dominant on the hillscape to the North of the City, however at ground level, pupils are presented with considered and appropriate entrance points. Nursery pupils are guided through a landscaped pre-school garden, to a single storey canopied entrance, with playful articulation and open aspects to the playroom and nurture spaces beyond. Infant pupils are catered for through individual classroom entrances at ground level, providing each teaching space with a ‘front lawn’ on approach, and mitigating any fear of crowding issues or intimidation in vertical circulation stairwells. For senior pupils, the grandeur of the school’s principal entrances reinforce their maturity within the establishment and allow them to embrace their pending graduation to secondary school by accessing the school and its upper floor on the diagonal axis that dissects the building floor plan. Internally, the building fosters transition by carefully aligning and considering relationships between year groups, offering the opportunity for social interaction in suitably scaled environments. Whilst the building’s central atrium reaches a height of 16 metres, the space is crafted to create intimate courtyard settings, intersected by a dynamic learning ‘bridge’. The smallest of the courtyards links the Early Years Centre with the infant classrooms, providing a library, group work and craft area for pupils to meet and explore. Glass screens link both the playroom and infant classrooms with this open plan area, allowing pre-school children the opportunity to identify and acclimatise to their next step, whilst infant pupils understand the journey they have taken in their first step through academia. 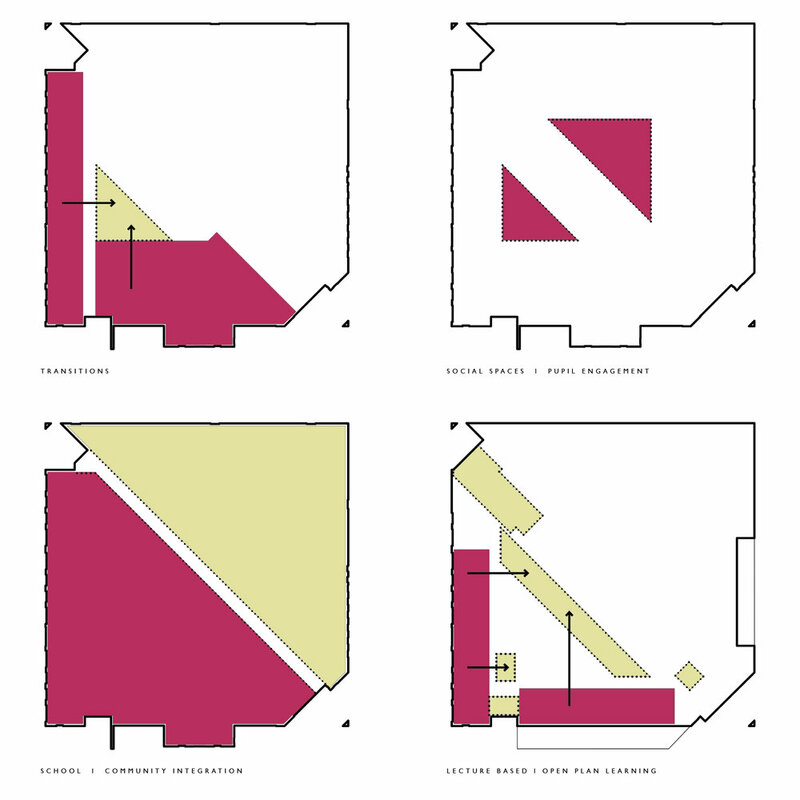 Classroom spaces and their connection to circulation and flexible learning remains intimate and protected at infant level, with limited areas of ‘double height’ volume, and the ability to shelter from the larger atrium and social spaces within the school. This arrangement provides the character of a newly formed infant school, where every facility is locally available, and the year groups can customise their environment and setting for learning. For junior and senior pupils however, the school opens up to form a dynamic and uplifting educational agora, with cascading floors addressing the central atrium, learning bridge and terraced group work areas. Pupils will graduate upwards through the building as they progress through year groups, easily mapping their journey and allowing the ability to reflect on achievements. The school eschews the traditional dining and assembly hall, and instead offers a tiered performance and social area, that allows for social gathering and dining, whilst forming the optimum space for science practical teaching, setting for art classes, and launch point for cross curricular engagement. The further consideration of the NE Campus design is the integration of both non-denominational and Roman Catholic school communities under a single roof, offering the ability to maintain school identity whilst embracing the opportunity for wider school collaboration. As demonstrated at the recent opening event at the campus, the design and layout of the building is encouraging continual dialogue between the associated senior management and teaching staff of each school, embracing every opportunity for learning as a collective, and celebrating not only the achievements of each individual school, but the outlook of the joint campus as a whole. North East campus is a truly ambitious project, which offers the optimum environment for pupils and for delivery of the curriculum. Moreover, this project clearly demonstrates that careful design at pupil level, can create the most intimate of learning spaces, within one of the largest primary schools in Scotland. We are currently undergoing a major transformation in our Glasgow studio, with extensive refurbishment works well under way to bring a new lease of life to 89 Minerva Street. Our Interior Design team have worked their magic to create a series of exciting new spaces in the office, all designed to encourage more flexible, creative ways of working, and all finished to an exceptionally high standard. We’re all looking forward to the grand reveal, so watch this space for further updates! Our Education Team had a fantastic few days at the Education Buildings Scotland Conference which highlighted all the wonderful work that is being undertaken in the Education sector in Scotland. We were especially delighted to receive the award for Architectural Practice of the Year and the Pupil / Student Experience award for Caol Joint Campus. These awards are testament to the talent, hard work and commitment of our wonderful Education Team, working in collaboration with our Clients, contractors and fellow consultants, to deliver high quality Education facilities. Our Holmes Miller Education Team are looking forward to attending the Education Buildings Scotland Conference this week at the EICC. Four of our projects [Lenzie Meadow Primary School, Caol Joint Campus, Balloch Shared Campus and Dalbeattie Learning Campus] have been shortlisted for Awards alongside a fantastic array of Education buildings showcasing the high calibre of design evident in the Scottish Education system. 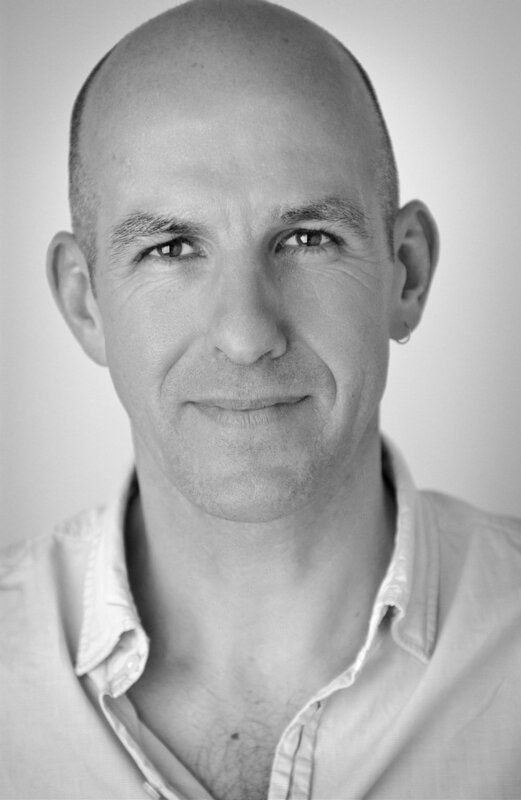 Our Education Director, Mark Ellson, will also be taking part in the 2040 Everyday Learning Workshop which will be an entertaining and lively discussion on the future of Education. We are looking forward to a wonderful few days and hopefully we’ll see you there.